There’s new details about a planet in Star Wars: The Last Jedi. A familiar Dino will return for Jurassic World 2. Steven Moffat teases a rather unorthodox, yet humongous, Doctor Who spoiler. Iain Glen discusses Jorah’s future on Game of Thrones. Plus, rumors of a returning foe for Jessica Jones season 2. Spoilers now! 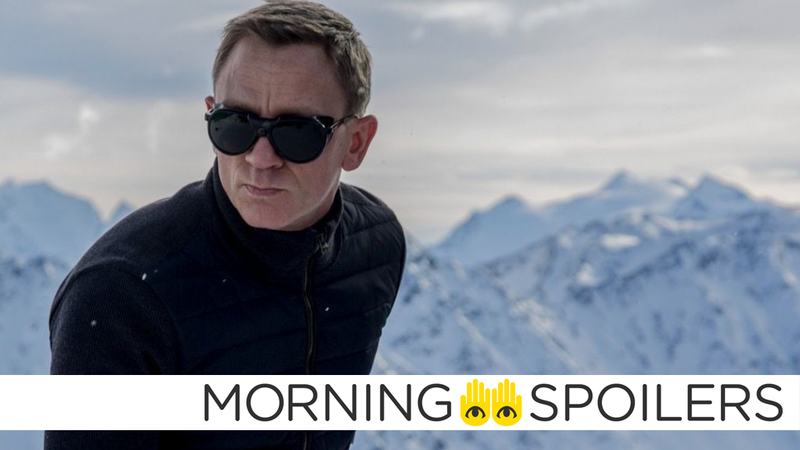 After all the will-he-wont-he hubbub of discussion surrounding Craig’s post-Spectre future with the franchise, Page Six reports producer Barbara Broccoli has “just about persuaded” the actor to do a final Bond film after backing his off-Broadway production of Othello. On top of that, their source added, “Barbara Broccoli doesn’t like [previous alleged favorite] Tom Hiddleston, he’s a bit too smug and not tough enough to play James Bond.” Ooh err. Making Star Wars reports the film’s scenes filmed in Dubrovnik, Croatia are set on a “casino planet” that is possibly called Canto Bight. I guess that’s a better name for one than the Hologram Fun World from Queen of the Empire. Colin Trevorrow responded to an adorable picture of a baby sleeping with a toy dinosaur to confirm that “Rexy”, the Tyrannosaurus Rex from Jurassics Park and World, is indeed returning. I mean I think he’s the biggest villain of Wonder Woman’s world, and so I think if you’re going to start off big, start off right with the greatest villain. Sam Mendes is in talks to direct Emil Ferris’ pulp-noir graphic novel, according to Deadline. Here’s a new poster from the UK for the film, courtesy of ScreenRant. I’ve always enjoyed playing Jorah. It’s been a role that’s been good to me so. There’s quite a high death count in Game Of Thrones and they don’t blanch at removing favorite characters. They just get rid of them in a brutal way. My end may well be close but so far I’m doing OK.
Then again, he might just be being pragmatic. A lot of people do just happen to die on Game of Thrones, after all. In more speculative news, a Tweet from actor Wil Traval may hint the return of Nuke in season two of Jessica Jones—especially as the show has allegedly already began production in New York City. During a screening of the pilot, Steven Moffat warned the audience there’s an “enormous spoiler” in the trailer for episode two. This is just a public warning... some people hate spoilers and some people love spoilers; and everybody hates me whatever way they think about it. So this is my last attempt in this role to avoid hatred. At the end of the [first] episode there will be yet another awesome trailer for Doctor Who. At the very end of the trailer there is, frankly, an enormous spoiler, a spoiler that may actually melt your brains. But I promise you, you’d be better off not knowing because - awesome though it will be here - it will be even more awesome in a few weeks’ time. So we’re gonna give you the option, in our frankly camp and ridiculous way. There will come up a warning and then there will be a countdown to the spoiler, and then there will be a warning to ‘blink now’. If at that point you close your eyes and wait until you hear the cliffhanger noise, you will have a better experience in a few weeks’ time.